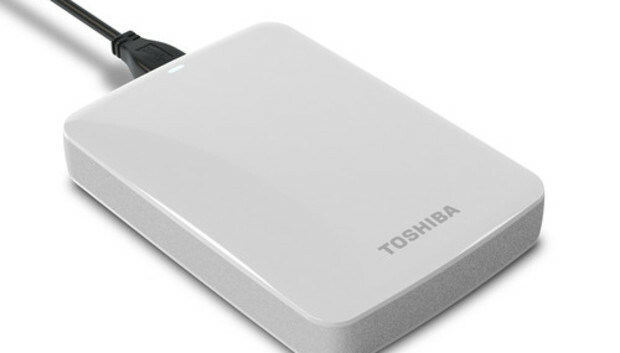 Toshiba is set to launch a portable USB hard drive that comes with PC or Mac software that can turn it into an Internet-accessible file server. The company said its Canvio Connect drive has built-in software that turns it into an online file server when it is plugged into a Windows or Mac computer. The contents of the NFTS drive can be accessed remotely from a different computer or smartphone, using apps for iOS and Android. The device will go on sale via Toshiba's website and "select retailers" in May in the U.S. It will be available in various sizes, from a 500GB version for US$99.99 to a 2TB model for $189.99. Both Windows and OSX offer remote file sharing, as well as a host of third-party applications, but those must often be configured separately for each computer. With Toshiba's software, the device can serve as a USB-based file server whichever PC it is connected to. Toshiba said the Canvio Connect will also come with 10GB of free online storage, but didn't say how long that offer would last. The drives measure 79 x 111 x 15mm, and come in colors including black, red, blue and silver. The company already offers a line of "Canvio Personal Cloud" hard drives for home use, with a similar remote access feature, that require their own power supply. Other firms such as Iomega and Buffalo offer similar products.